New York, NY - On Sunday, June 26th, the 1st Sunday after Pentecost, His Grace Bishop Dr +Mitrophan (Kodic) served with Fr Toma Popovich and the faithful of the St Sava community in Manhattan. 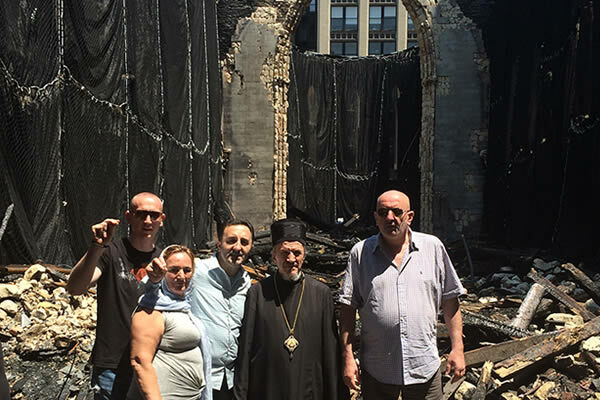 Following the terrible inferno that engulfed and destroyed the community’s historic cathedral, the parishioners have been gathering in other local places - most recently at the General Theological Seminary chapel in Manhattan. 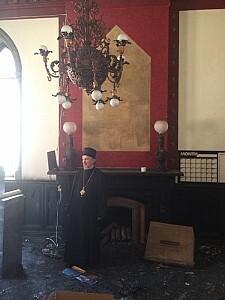 This week marked His Grace’s first service with the parish since the destruction of St Sava cathedral. He spoke to the spiritual stewardship and faith that will restore the parish church; that which is material, such as donations or financial contributions, will follow as a result of that faith. May God bless the St Sava Cathedral community as they continue to grow in the faith that will enable them restore their church in New York City!